What Are Military Friendly® Schools? Balancing the responsibilities of adulthood with the obligations of being a student can be difficult for anyone, especially military service members who are returning to civilian life. To help current and former service members choose the schools that could best suit their needs, website and magazine G.I. Jobs, conducts an annual survey to identify which schools are Military Friendly®. What Makes a School Military Friendly®? Many factors define the Military Friendly® designation including a commitment by schools to serving the military by policy, dedicated staff to aid military students, and that there is a positive return on investment for military students. How do you know if you’ve found a Military Friendly® school? Aside from the Military Friendly® designation, here are five qualities to look for. Some schools, such as The Refrigeration School, offer help applying for financial aid and veterans’ benefits. They also provide military tuition pricing to eligible current and former military members and their families. Finding a school that has flexible class times can be helpful if you plan on working while you study. If your spouse or child wants to go to college or trade school, check to see if the desired institution offers financial discounts for military spouses or dependents. Protecting and defending the United States is one of the greatest services one can offer the country. Once military members return, the Department of Veteran Affairs provides military benefits to assist with funding for career training. 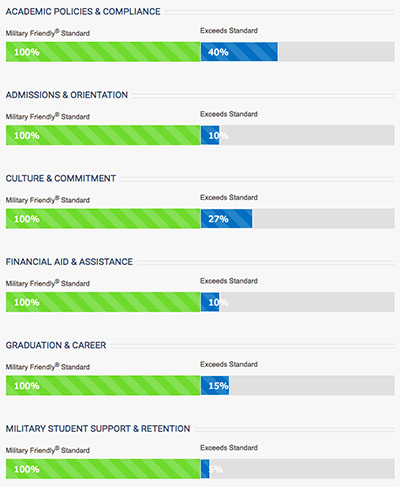 When evaluating schools, the Military Friendly® designation, along with the considerations presented above, can help current and former service members make the choice that could best suit their unique student needs.